OXFORD, Miss. 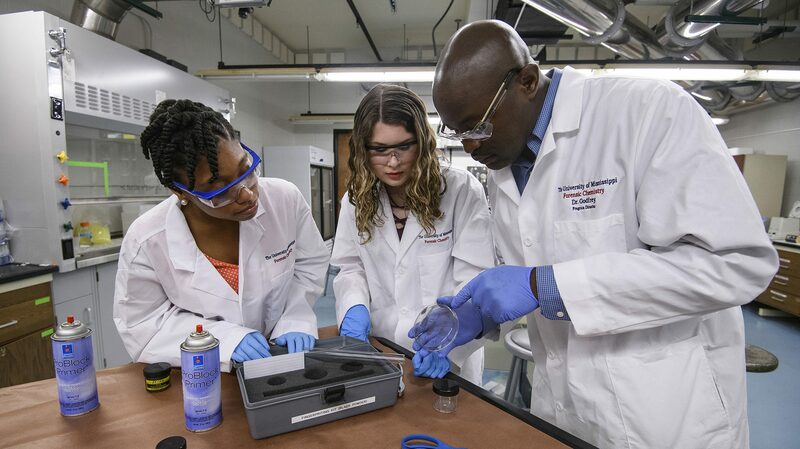 – The University of Mississippi’s annual economic impact totals $2.9 billion and enables 43,121 jobs across the state, which means that one out of every 37 jobs in Mississippi is supported by the activities of UM and its students. A new report of the university’s impact also revealed a return of $4.40 in state tax revenue and public sector savings for every dollar in state funds that supports the university. The study, which was commissioned by the university and conducted by a nationally recognized economic consulting firm, analyzed data from fiscal year 2016-17 to measure the economic impacts created by UM and the benefits the university generates in return for investments made by its key stakeholder groups: students, taxpayers and Mississippi society. The study used a two-pronged approach that involved an economic impact analysis and an investment analysis. 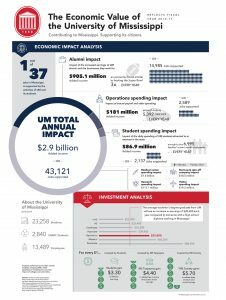 The $2.9 billion in income UM added to the Mississippi economy in the analysis year represents the sum of impacts from operations, research and medical center spending; startup and spinoff companies; visitor and student spending; and alumni. It represents approximately 2.6 percent of Mississippi’s total gross state product. In FY 2016-17, Mississippi taxpayers provided $121.5 million in funding for UM Oxford and regional campuses. In return, taxpayers will receive an estimated present value of $442.9 million in added tax revenue stemming from students’ higher lifetime earnings and increased business output. In addition, $96.9 million in taxpayer benefits are generated by the improved lifestyles of Ole Miss students and the corresponding reduction in government services. This means that for every dollar of public money invested in educating students, taxpayers receive an average of $4.40 in return. In other words, taxpayers enjoy an annual rate of return of 10.6 percent. “The results of this study highlight the value of the University of Mississippi from multiple perspectives,” said William Nicholas, UM director of economic development. “Businesses benefit from increased spending by UM and a steady flow of top talent, graduates enjoy a lifetime of higher earnings and state taxpayers benefit through increased tax revenue. The study also predicted that students attending UM in FY 2016-17 will receive $1.8 billion in higher future earnings over their working lives as a result of their education and training. This translates into a return of $3.30 in higher future earnings for every dollar that students invest in their education. Among noneducation industry sectors, the university delivered the greatest impact in the health care and social assistance industry sector, supporting 13,496 jobs in FY 2016-17. Expenditures on medical center operations added a net $1.6 billion in added income to the state. The university enrolls more than 23,000 students and employs 13,489 people. The “Analysis of the Economic Impact and Return on Investment of Education” study was conducted by Emsi, a leading provider of economic impact studies and labor market data to educational institutions, workforce planners and regional developers in the U.S. and internationally.